Attleboro, 1 @ Mansfield, 8 – Final – Mansfield’s Lauren Clang and Alicia Hottleman each scored a pair of goals as the Hornets’ offense exploded for its highest-scoring outing of the season. Kristina O’Connell, Abby Varrichione, Emily Ierardo and Hayleigh Crawford each scored once for Mansfield. Abigail Boudreau scored for Attleboro. Canton, 6 @ Milford, 0 – Final – Canton’s Maggie Malloy netted a hat trick to lead the Bulldogs to a big win on the road. Franklin, 2 @ Taunton, 3 – Final – Taunton erased a pair of deficits and then scored the winner late in the second half to pull off a win over visiting Franklin. Franklin went up 1-0 on a goal from sophomore Erin Walsh on a feed from junior Ashley Reutlinger. Taunton tied the game on a goal from Liana Duarte, but Franklin regained the lead behind a tally from freshman Victoria Quinn, assisted by Cassi Ronan. Taunton senior Kya Enos scored the equalizer to make it 2-2 and senior Diana Brens scored the late winner for the Tigers. Taunton goalie Emma Sheehan (15 saves) received praise from both THS head coach Mike Fox and FHS head coach Lisa Cropper. Fox also noted the strong defensive play of Mabel Smith, Jocelyn Pagliuca, and Riley Murphy. Oliver Ames, 0 @ King Philip, 1 – Final – After over 45 minutes of scoreless play, King Philip finally broke the deadlock with the lone goal of the game. KP senior Liz Furfari scored with 13:10 left on an assist from junior Caroline Klim. Sharon, 2 @ Canton, 3 – Final – Canton overcame a 2-1 deficit to pick up a 3-2 win over visiting Sharon (25-14, 19-25, 25-27, 25-11, 15-12). Nicole Brown had 22 assists, five kills, and four aces for the Bulldogs while Hannah Jerrier had eight kills and four blocks, and Rose Hazam added five kills, two aces, and 18 digs. Franklin, 3 @ Mansfield, 1 – Final – Mansfield earned a big win in the first game, but Franklin rallied for three straight to earn the win (10-25, 25-10, 25-15, 25-20). FHS junior Lauren McGrath set the offense up with 40 assists and three aces, Hailey Sanders notched 11 kills and three blocks, Ellie Wisniewski had 10 kills and four aces and Maggie Doyle added nine kills and five blocks for the Panthers. For Mansfield, Meg Hill had 17 kills, Julia Harrison had 12 kills and Jolie O’Neil finished with 10 digs. Stoughton, 1 @ North Attleboro, 3 – Final – North Attleboro dropped the first game but rattled off three straight wins to claim the Davenport division title outright with a 22-25, 25-18, 25-23, 25-14 win over Stoughton. Senior Leah Marceau had 26 assists, spreading the ball around to balance the Rocketeers’ attack. Amelia Murphy led the way with 12 kills and five aces, Anna Caristi had 10 kills and five blocks and Kezie De La Cruz added 10 kills and four aces. Taunton, 0 @ King Philip, 3 – Final – King Philip celebrated Senior Night by clinching its second straight Kelley-Rex division title with a 25-14, 25-13, 25-20 win over visiting Taunton. KP senior Sydney Phillips had 11 kills, seven aces, and three digs, Michaela Palumbo added seven kills and two aces, Grace Ely had nine kills, and Julianne Rando chipped in with seven digs. King Philip, 167 @ Attleboro, 162 – Final – Attleboro won its third match in three days to punch its ticket to the D1 South Sectional, the program’s first postseason appearance since 2010. Kyle DelSignore led the Bombardiers with a low-round of 38 while Ethan Johnson shot a 40. Jack Handy carded a 41 and Taron Mills shot 43 for Attleboro. King Philip’s Matt Stanton earned co-match medalist honors with a 38. Canton, 151 @ Oliver Ames, 144 – Final – Oliver Ames emerged as the winner in a battle of two unbeaten teams, finishing the regular season 15-0. Canton finishes 13-1. It was no secret of how much talent both teams have as the top four golfers from each side all finished under 40. OA’s Ryan McGarry, who birded on the second and fourth holes, earned match medalist honors with a 34. Thomas Walsh carded a 36 for the Tigers while both Nolan Donze and Eric LeBlanc each shot 37. Joey Vaughan led Canton with a 36 while Danny Powers and Thomas Singleton each carded rounds of 38 and Jack Goyetch fired a 39. Taunton, 181 @ Stoughton, 180 – Final – Stoughton picked up its first win in four years, edging Taunton by a stroke at Easton Country Club. Brendan Campbell and Luke Bainton led the way for the Black Knights, each carding a round of 43 while Josh Hough shot a 44 for Stoughton. Canton, 2 @ Franklin, 3 – Final – Franklin scored a pair of goals inside the first five minutes of the second half, breaking open a tie game to earn the win. Freshman Amanda Lewandowski scored her first career goal, which turned out to be the game-winner, just minutes after senior Maddy Hinckley put the Panthers up 2-1 early in the second half. Junior Annie Walsh scored Franklin’s first goal on an assist from Regan Paterson. FHS head coach Lisa Cropper said junior Anna Jardine (12 saves) was stellar in net and also praised the play of sophomore Courtney Davenport, who made her varsity debut. Sharon, 0 @ Mansfield, 7 – Final – Abby Varrichione and Hayleigh Crawford each scored a pair of goals to lead the Hornets to a home win over visiting Sharon. Ann Maher, Kristina O’Connell and Heather D’Ambra also scored once for Mansfield while Alicia Hottleman and Maggie Danehy notched assists in the win. Milford, 0 @ Oliver Ames, 5 – Final – Click here for a recap of this game. King Philip, 172 @ Sharon, 173 – Final – King Philip’s Nate Ihley carded a team-low round of 41 to help the Warriors edge Sharon at The Cape Club. Sharon’s Russell Rapaport earned match medalist honors with a low round of 39. 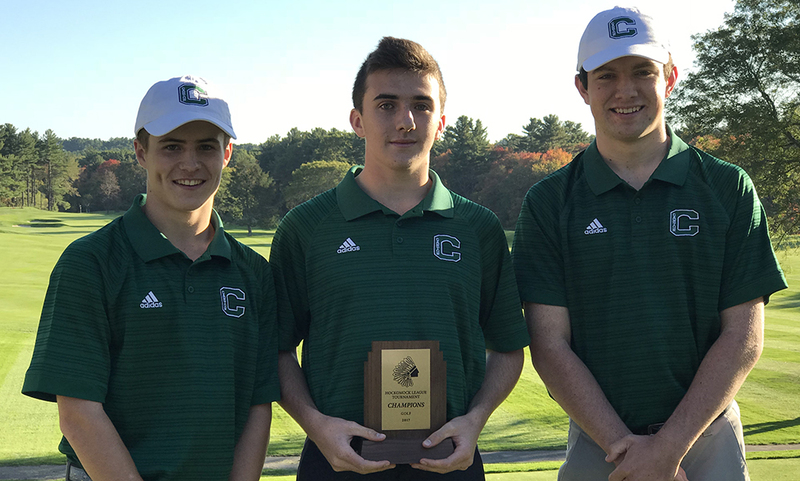 Attleboro, 161 @ Canton, 141 – Final – Canton’s Jack Goyetch, Joey Vaughan and Niko Donovan all had their best performances of their careers on Thursday afternoon, leading the Bulldogs to a big win over Attleboro. Goyetch shot a two-under-par round of 32, Vaughan carded a one-under-par round of 33 and Donovan shot a career-best 38. Chris Lavoie and Thomas Singleton also carded rounds of 38 for the Bulldogs. Attleboro’s Ethan Johnson and Taran Mills each shot 39 for the Bombardiers. Taunton, 189 vs. New Bedford, 226 – Final – Taunton’s Cam Williams shot a team-low round of 42 to lead the Tigers past New Bedford. Kyle Robinson chipped in with a round of 46 for the Tigers.